Once known as the world’s ‘bicycle kingdom,’ China has experienced rapid urbanization leading some to declare the beginning of the end for China’s bikes. While it’s true that from 1995 to 2005, China’s bike fleet declined by 35 percent and private car ownership more than doubled, there is no evidence today that bicycles are a thing of the past on Beijing’s streets. Increased urbanization and growing diversification of transport has only meant cycling Beijing streets is becoming a greater challenge, particularly in areas where designated bike lanes have been removed. 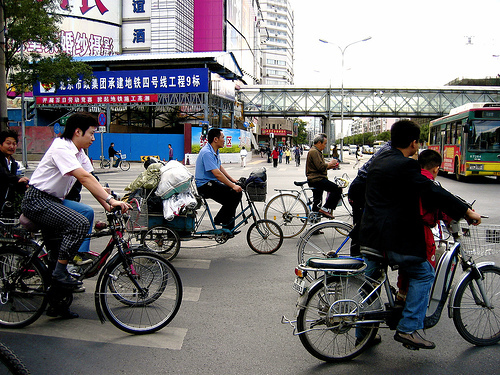 Cycling in Beijing – let alone mastering the art of walking Beijing’s overcrowded streets brimming with buses, cars, bicycles, motorcycles, and some 18 million people – is (in a word) terrifying, yet somehow millions of Beijingers seem to cope just fine. Helmets are nonexistent, and the agile Chinese have mastered the art of multi-tasking while cycling. Not only do people seem to cart their livelihoods on bikes, but I’ve witnessed whole families perched atop a single tandem, ladies cycling one-handed with umbrella in tow to prevent any sun exposure that would risk their pale complexions; I even saw a man with three 15” computer monitors strapped above his back wheel (and they were not flat screen). And you’ll never see a hint of the abashed – anything goes in the Beijing bike lane. Photo by My Left Ventricle. Aside from the physical factors that make cycling Beijing streets daunting are the very real environmental effects one feels after a short bike commute to work. Beijing’s plentitude of dust and frequent sandstorms often leave me with a mouthful of grit by the time I arrive at my destination. Any pedaling above a moderate speed leaves one gasping from all the particulate matter that takes up residence in your lungs. 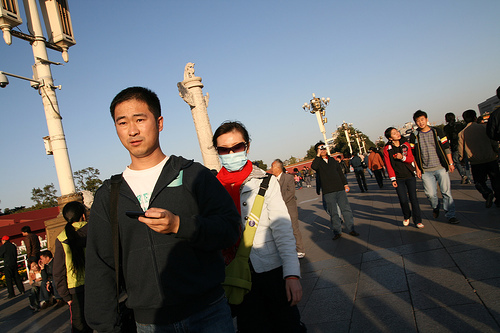 It’s no wonder Beijing cyclists often wear surgical face masks or full-face visors that are indeed function over fashion. Despite what you may have heard, bicycle is still king in Beijing.